Dr Inmaculada Ortiz Uribe and Dr. Eduardo Laborda Ochando, winners of the XII CIDETEC awards, received from Dr. Vicente Montiel Leguey, as president of the jury and on behalf of the Basque technological centre CIDETEC, the prize and certifying diplomas within the "Focus Group XXXVII Meeting of Electrochemistry of the RSEQ" held in Alicante between 17th and 20th July 2016. 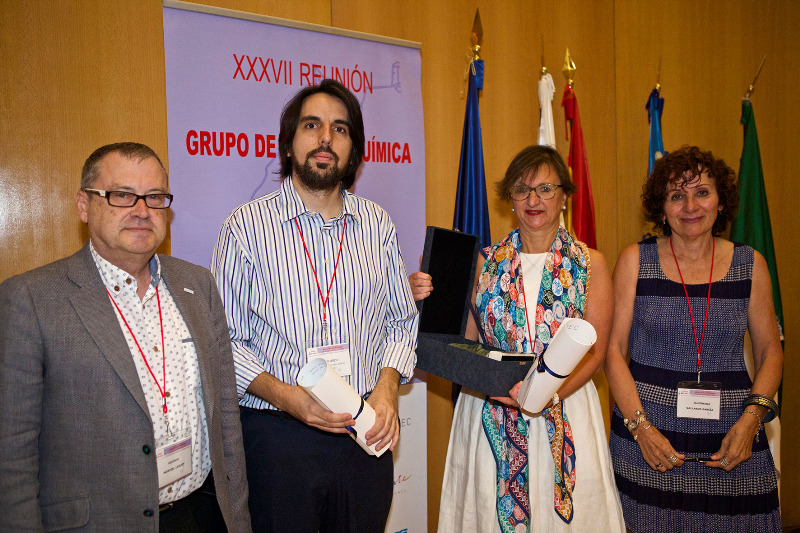 Dr EDUARDO LABORDA OCHANDO, from the University of Murcia, received 2,000 euros, the trophy and the certifying diploma of the CIDETEC 2015 Award in the category of "Young Researchers in Electrochemistry". The CIDETEC 2015 Award in the category of "Scientific Research in Electrochemistry", worth 4000 euros, a trophy and certifying diploma, went to the research "Contribution of Electrochemistry to sustainable development" and was received by Ms. Professor INMACULADA ORTIZ URIBE of the university of Cantabria, on behalf of the winning researchers. The CIDETEC awards have become a benchmark of excellence in Spanish ELECTROCHEMISTRY and is a hallmark of the activities of the specialized group of Electrochemistry of the RSEQ. In the coming months the reconvening of the 2016 CIDETEC awards modalities of "Scientific Research in Electrochemistry" and "Young Researchers in Electrochemistry" will be announced. In the main photo, from left to right: President of the Jury of the CIDETEC 2015 Awards, Dr. Vicente Montiel Leguey, Dr. Eduardo Laborda Ochando of the University of Murcia, Dr. Inmaculada Ortiz Uribe at the University of Cantabria and Dr.Iluminada Gallardo Garcia, member of the Jury.